You can visit McDonald's at 291/293 High Street, about 0.19 miles east of the centre of Orpington (nearby High Street / Orpington War Memorial). This restaurant is fittingly situated for patrons from Ramsden, Orpington Town Centre, Goddington, Crofton, St Mary Cray, Farnborough, Poverest and Petts Wood. Today's (Thursday) business times are 6:00 am to 11:00 pm. On this page you will find all the information about McDonald's Orpington, High Street, including the working hours, location details and email contact. McDonald's is easily accessible close to the crossroads of High Street and Knoll Rise, in Orpington, Kent. Simply a 1 minute drive time from Homefield Rise Roundabout, Sevenoaks Road, Orpington War Memorial Roundabout and Station Road; a 4 minute drive from Perry Hall Road, Spur Road and Crofton Road; and a 12 minute drive time from A21 / Farnborough Common and A21 / Farnborough Way. BR6 0NN is the postcode for this restaurant when using Sat Nav. Regular buses can be reached at High Street / Orpington War Memorial, Orpington / Walnuts Centre, Hillcrest Road and Orpington Police Station. Services include the 51, 61, 208, 353, R1, R2, R3, R5, R6, R7, R8, R9, B14, R10 and R11. The tube will run to Croxley Station (2.60 mi away). Transportation is regularly accessible via the line: Metropolitan. If you are coming by train, you can disembark at Orpington Station (2390 ft), Chelsfield Station (1.44 mi) and Petts Wood Station (1.50 mi away). Line that stops nearby: Southeastern. This restaurant is a short walk from Orpington College, Orpington Library, Priory Gardens, Broxbourne Gardens, St Olave's And St Saviour's Grammar School and Holy Innocents' Catholic Primary School. Right now, McDonald's has 2 locations in Orpington, Kent. Visit this page for all McDonald's restaurants near Orpington. 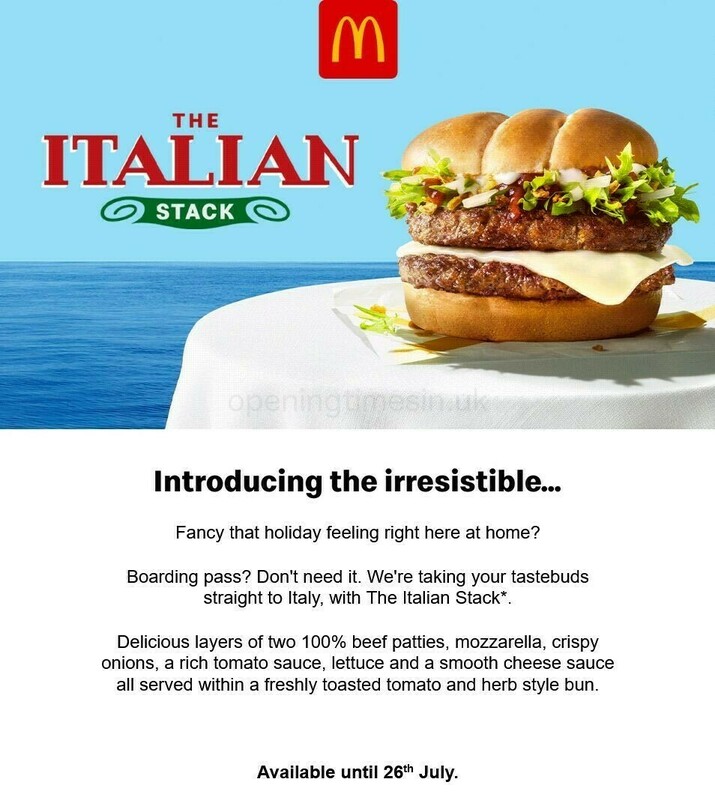 Please take into account that the UK holiday season may cause modifications to the usual opening times for McDonald's in Orpington, High Street. Throughout 2019 these exceptions apply to Christmas, New Year's, Good Friday or Black Friday. The best way to get verified info about seasonal operating hours for McDonald's Orpington, High Street is to go to the official website, or phone the direct contact number at 370 524 4622. Our desire is to supply you with the latest information as possible. Please don’t hesitate to use this form to report any mistakes with the address info or restaurant hours for McDonald's in Orpington, High Street. Using the form provided below, you are invited to write your critique of McDonald's, and rate the location using the star ranking system.